After a trip to the Sydney markets we had a kilo of delicious scallops to play with. This is a lovely way to cook them. This is a light snack or a starter course so don’t expect to be full afterwards. This’ll serve 2. To make the puree: simmer the broccoli in the milk and cream until tender. Drain the liquid and reserve. Add 1/2 tablespoon of the butter to the broccoli and then puree (using a hand blender) into a thick paste. Add some of the reserved cooking liquid, a tablespoon at a time, until you reach a smooth, creamy consistency. Add a little salt & pepper. Leave to cool. In another pan, add the remaining butter and heat gently till it turns a nutty brown colour. Add the lime, brocolli puree, tomatoes and chives. Stir till warmed through but not boiling. Remove from heat. To cook the scallops. 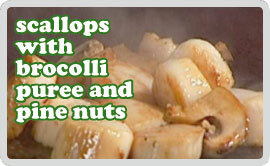 Heat the oil over a medium hot heat and cook each scallop for 1 minute on one side and 15 seconds on the other. Place a generous dollop of the puree then add 6 scallops per person on top. Sprinkle over some pine nuts, some fresh watercress and a teaspoon of balsamic vinegar.